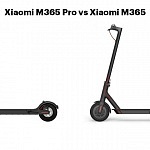 This is probably the most discussed e-Scooter topic currently – Xiaomi M365 Scooter or Ninebot Segway ES2 – which one is better? Both Xiaomi M365 and Ninebot ES2 come almost fully assembled. You just need to attach the handle bar with 4 screws on each e-scooter, as they are detached to achieve a smaller package. Both boxes hold the required tools as well as charger and cables to charge the built-in batteries. Ninebot ES2 is missing a bell, which is legally required in some countries. 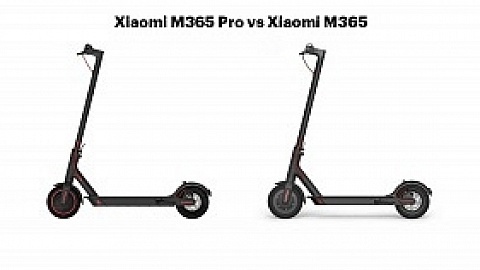 There are different versions of Xiaomi M365 scooter – Europe Version and International Version. The EU version comes with 2 extra wheels and inner tubes. If you are curious about charger type and plug: the charger is made for 100-240 V input and you can easily replace the 2-pol cable with the plug you need. So, go for the cheaper version! 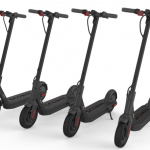 Both Ninebot Segway ES2 and Xiaomi M365 are made of a sturdy metal frame and weight about the same – around 12.5 kg. They are also about the same height. The footsteps also have similar dimensions, 55cm long and 15 cm wide with a rubberised finish to keep a strong and non-slippy position while standing. 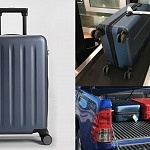 The maximum weight of the driver shouldn’t exceed 100 kg on both of them. Below the footstep both hold a foldout stand to sturdy park your scooter. Xiaomi M365 and Ninebot ES2 fold within seconds, the mechanism sits between steering bar and footstep. When folded Xiaomi M365 is shorter (106cm) than Ninebot ES2 (113cm). That was an issue for me as I tried to fit them in my trunk. On the other side Xiaomi M365 is higher (48 cm) vs Ninebot ES2 (40cm). I prefer the design of Xiaomi M365 – but that’s personal taste. The bar of Ninebot ES is thicker and holds the battery whereas Xiaomi M365 has a thinner bar and the battery is placed below the footstep. That’s why I think Xiaomi Mijia is better balanced and more convenient to drive & carry. I also prefer the folding mechanism on Xiaomi. So overall for me this category is a Xiaomi M365 win. The motor power of Segway Ninebot ES2 is stated with 300W, while Xiaomi Mi Scooter states 250W motor rated power. Nevertheless, both sit in the front wheel and power the scooter up to 25 km/h max. 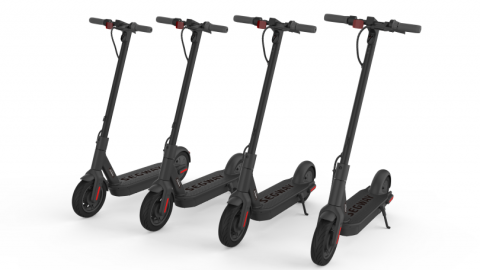 According to respective manuals, Xiaomi M365 Scooter holds a 280Wh battery that gives you 30km range, while Segway Ninebot ES2 holds a 187Wh battery for 25km range. In my tests both provide a bit over 20km range and seem to be equal in that category as well. Also charging time differs a bit from the manual. While 3,5 hrs. are stated for ES2 it is closer to 4 hrs but still a bit shorter than the stated 5,5 hrs. for Xiaomi M365. 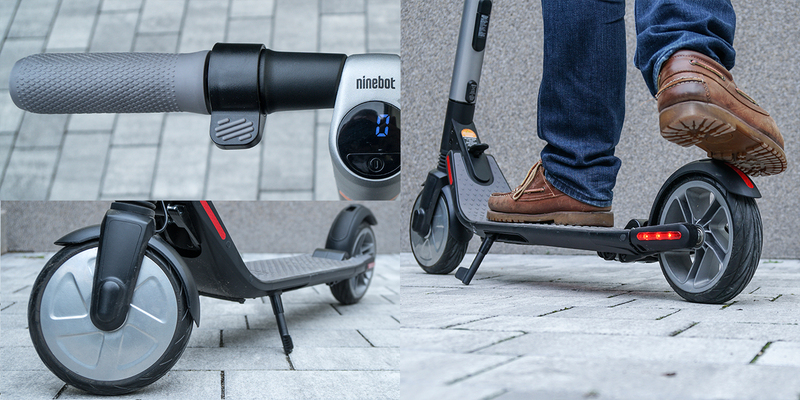 But there is another major difference: You can hook up an extra battery to Ninebot ES2 which increases the max. speed to 30 km/h and extends the range to 45 km. Despite having different motor power and battery capacity the performance seems equal. Due to the fact that you can increase speed and extend range with an extra battery Ninebot ES2 wins. If you don’t go for that extended batterie, I’ll call it a tie. Both e-scooter provide a white front LED headlight and a red rear-light. Additionally, Ninebot ES2 offers an underbody light. 16 LEDs can be controlled via the app and offer several effects and colors. The headlight of Xiaomi M365 is a bit brighter than the one from Ninebot ES2. When you hit the brakes, both rear LEDs flash. Xiaomi Scooter M365 only provides 4 LEDs to indicate the battery status. When switched to Eco Mode it is indicated with a different color on the bottom LED. If you want to seed the speed, you need to monitor via app. Ninebot ES2 provides more information on a display. In addition to battery level and indication of one of the 3 modes you can see a speedometer and Bluetooth status. I think the display is a “nice to have” rather than a “must have”. Both provide the most important info and that’s battery status. Nevertheless, one of them shows more info and has underbody lights, and therefore Ninebot ES2 wins, but I think it’s not a main criterion. Xiaomi M365 Scooter and Ninebot ES2 provide a different solution. 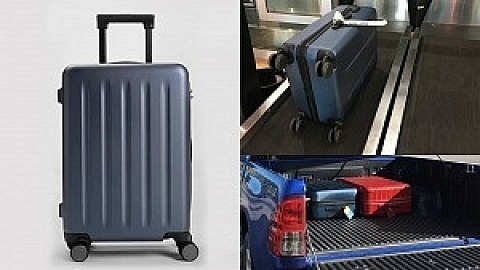 Xiaomi M365 is using tube air tires, you can see the valve in the top left image. It is super tricky to inflate them without the included adapter. 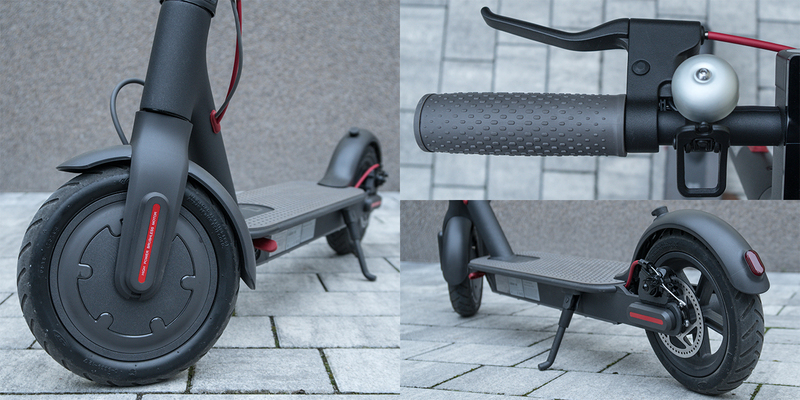 On the other side Ninebot ES2 uses solid rubber tires, but therefore ES2 offers suspension on front & back wheel. Air tires can deflate or puncture. Changing the tubes on Xiaomi M365 can be bothersome, especially on the front wheel where the motor is integrated. You don’t have these problems with Ninebot ES2. Although the suspension is not as smooth on uneven grounds, course asphalt or cobblestone compared to the air tires. I also think the suspension provides a shaky stand on the Ninebot ES2. Xiaomi feels more compact and sturdier. So even if there can be problems with the air tubes, I think it gives a better ride comfort and therefore Xiaomi M365 wins. On a side note: There are solid rubber tires for Xiaomi M365 available, but as stated above I prefer the air tires. Further I’m not sure how the solid tires perform on M365 without having suspension at all. It seems the mechanical disk brake on Xiaomi M365 is the primary brake while the electrical brake in the front wheel is auxiliary. When you let go the gas lever M365 decelerates. You can set the strength within the app. On the left side of the handle bar you got a brake handle for the disk brake. Ex-factory it is a bit weak, but you can fix that with a screw. On the Handlebar of Segway Ninebot ES2 there are two levers. Electronic brake on the left side and throttle on the right side. With ES2 it seems the electronic brake is the primary brake while the mechanical brake is auxiliary. This one is a simple: a step-on brake, you need to step on the wheel cover, known from early days kickscooter. It’s arguable which system is better. Maybe the disk brake of Xiaomi M365 provides a faster emergency stop with more control, but you can’t quickly change the strength of the front brake, so basically you have just one it influences. On Ninebot ES2 you can influence both brakes in an emergency situation: brake electronically and step on the mechanical brake. I think the solution of Ninebot is also smarter as you are using the electronic brake primarily which regenerates battery life and therefore Ninebot ES2 wins. The handling bar looks pretty similar. The brake lever is on the left and the accelerator on the right. In the middle there’s the power button. Xiaomi M365 features 2 modes: Eco (18 km/h) and Standard (25 km/s). You can switch by pressing the power button twice. In Eco mode the LED on the bottom turns green. Ninebot ES2 features 3 modes: Eco (5 km/h), Normal (15 km/h) and Sport mode (27 km/h) which is indicated on the display. You have to press 2 times to switch modes. Both e-scooter are pedal assisted. That means you need to give it an initial push and then accelerate after reaching a basic speed. Afterwards you can cruise fully on electric power. Handling is pretty similar – One button controls it all. Ninebot ES2 needs less force to initiate electric cruise, a slight push is enough. Both of them offer cruise control which is set in the app and is activated when holding the gas lever for 5 seconds at the same position. The folding mechanism lock of Xiaomi M365 is easier to operate. I’ll call it a tie. As already mentioned, the EU version of Xiaomi M365 only connects to Mi Home app, while the international version also connects to Ninebot app! Both apps are available for iOS & Android and offer pretty much the same features and settings. You can see actual speed, average speed and mileage. Turn on/off cruise control or change light settings. You can switch between metrical and imperial system display or upgrade the firmware if available. Both also offer an anti-theft function where you can lock your scooter. If someone tries to push it away the brakes block and the scooter sounds a warning tone. I couldn’t connect my EU version of Xiaomi M365 to Mi home app on iOS at all. It finally worked out with Android. The Segway-Ninebot app runs way smoother and I didn’t experience any problems. You don’t need to app for daily usage, but it is important to change some settings. Clearly one app is better than the other and, in this category, Ninebot ES2 wins. The price is currently pretty much the same. I bought my Xiaomi M365 from Gearbest and shipping worked out very well. I borrowed Ninebot ES2 from a friend who got it at a local store. At first, I thought Ninebot ES2 will be my winner when looking at the features. I got some sweet new details compared to the older Xiaomi M365. It’s nice to have a display on the handle bar as speedometer. Also, the underbody lighting is quite fancy. I really like the brake system of Ninebot compared to Xiaomi. This way the main brake is a regenerative one that gets power back into the battery. Speaking of batteries: I prefer them built-in under the footstep like on Xiaomi M365. This way a better center of gravity is achieved and that has a positive influence on driving experience. It’s also more convenient if you need to carry your scooter in public transport as Xiaomi feels better balanced. On the other hand, you can shift Ninebot around quicker as the footstep is light to move. The main difference for me is the tire/suspension system. With air tube tires you can get a puncture and you need to change them. You also need to take a look at air pressure from time to time. But I think Xiaomi M365 feels way smoother on the street than Ninebot ES2. Not sure if this is only related to tires/suspension or also to center of gravity as already mentioned. The app is not constantly needed, but essential if you need to change some settings. It was really bothersome to try and fail connecting Xiaomi M365 over and over again on my iPhone. Having a stabile app is definitely a plus. Even though I really, really like the superior Ninebot ES2 features such as: brake system, solid tires, display, LED underbody lights, better app & the option for an extra battery. When it comes to the quality of riding pleasure, I go with Xiaomi M365. Also, check out the new Xiaomi M365 Pro! For more and current info check out the Xiaomi M365 Facebook Fan Group!